​as fruits of my service and sacred arts over the course of 2017. 1. New Swaybone music videos! Sacred Grunge lives!!! 2. Theo Cedar Jones solo acoustic videos - originals and covers. 3. New! Color Swigglehorff chalk paintings. 4. Theo Cedar Jones' video blogs at his Youtube Channel. 5. Swigglehorf - Abstract action drawings. 6. A Declaration of Global Sovereignty. Below is the first chapter of my book "The Plan - How to save the World", a creative guide on how to embrace prior unity, harm reduction, non-violence and the Global Cooperative Forum as the means to save humanity and our Earthworld. 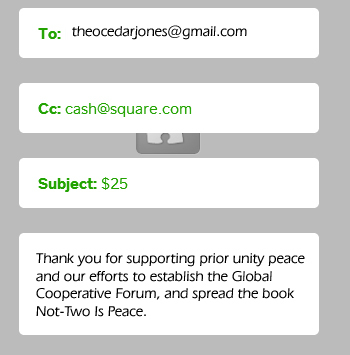 It's easy to support the "cause" using The Square. Just fill out an email with the following.